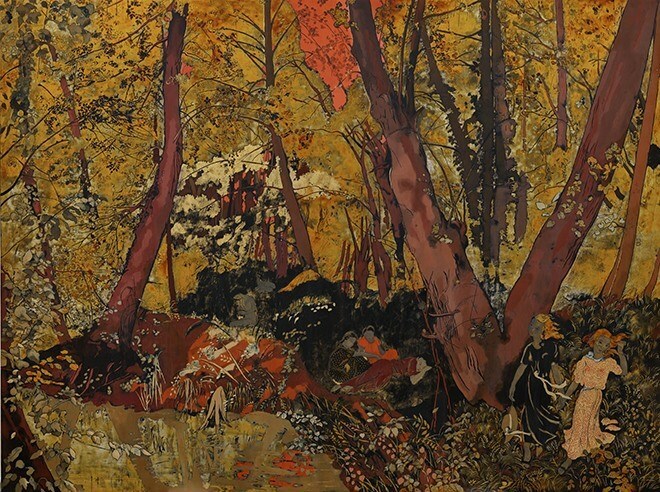 "Femmes Dans La Forêt” by Alix Angèle Marguerite Aymé sold for over 151,200 USD. Hanoi (VNS/VNA) - Two lacquer paintings by noted French painter Alix Angèle Marguerite Aymé (1894-1989), who was a teacher of various leading painters in Vietnam, sold at high prices at an auction held at Sotheby’s Hong Kong on April 1. Her lacquer paintings titled Femmes Dans La Forêt (Women in the Forest) (150cm x 200cm) sold for over 151,200 USD, while her Liseuse À Côté De L’annamite (A Girl Reads on a Hill in Vietnam) (46cm x 70cm) sold for 31,800 USD. Experts consider Femmes Dans La Forêt a masterpiece of Vietnamese lacquer art. Born in France as Alix Angèle Marguerite Hava, the artist married Professor Paul de Fautereau-Vassel in 1920. The couple then moved to Shanghai and later to Hanoi. In 1925-1926, she taught drawing at the French Lycée in Hanoi. The couple returned to France to live between 1926 and 1928 and had a son. She then separated from Fautereau-Vassel and returned to Indochina with her young son. In 1931 she remarried Colonel, later General, Georges Aymé, future deputy to Lieutenant-General Eugène Mordant, in command of the French Army in Indochina. She also travelled and painted in Laos, as she was familiar with the family of King Sisavang Vong, and her large frescos were displayed in the Royal Palace in Luang Prabang. She became a teacher at the École des Beaux-Arts de l’Indochine (School of Indochina Fine Arts), where she contributed to the birth of lacquer painting, according to fine arts experts. At the school, she inspired many painters to make lacquer paintings, including noted painter Nguyen Gia Tri (1908-1993). At the same auction sale on April 1 in Hong Kong, titled Modern and Contemporary Southeast Asian Art, the lacquer painting Goldfish (60cm x 100cm, 1953) by Truong Van Thanh sold for 22,000 USD. A lacquer box with an image of a countryside pond by Pham Hau (46cm x 23,5cm x 8,5cm, 1939-1940) sold for 25,400 USD. Another painting by Pham Hau titled L’entrée Du Village (121,5cm x 54cm) sold for 76,400 USD.